English singer-songwriter from Oasis. In The Guardian in January 2000 he said, "I said we were bigger than God, but what I meant to say was taller. I believe Jesus was 5ft 7in and I'm 5ft 8 1/2 in"
Would be interesting to see a picture of Big Rob next to Noel Gallagher. I doubt it's gonna happen though sadly. I think he's just 5'8" more or less, and a good example of one, since it is overrall start of average and not short. It would be interesting to see him pictured with Rob! I still think there's validity to his 5ft8.5 claim. He can look at least that with people like Alan Carr and Jason Statham. He often pulls off a near average range rather than short. No taller than 174, and no shorter 173. I can't open those two images for some reason - must be my rubbish phone, lol. I'll try on a PC. Remember though, that Liam often only looks 5' 9.5" with people. He mostly wears flat half-inch shoes, giving the illusion that he's a bit shorter than he really is. His posture isn't great a lot of the time too. That is a fair point about his hair. It definitely has more texture and volume now than it was in the 90s, but I'd dispute Liam having as much as 2 inches on Noel. Noel can look 5' 8.5" a lot - but also 5' 8" just as often. When both are stood straight in the same footwear, there's no less than 1.75" between him and Liam. Noel styles his hair a lot differently to how he did in the 90s - a lot more texture and volume now, giving the illusion of an extra fraction of height. You'd never say 5' 8.5" minimum alongside Johnny Depp or Sir Paul McCartney, for example. I think the 5' 8.25" really is spot on overall. The more I see of Noel actually the more I think his own 5ft8.5 claim is credible. With people like Gervais,Mo Farah,Tony Blair,Matt Smith and Simon Cowell he pulls it off easily. I actually think there's no more than 1.5 inches between him and Liam and often it can look less owing to Liam's poor posture. Certainly I can't see him below solid 5ft8 range. I don't think Albarn has a full 3 inches on him. More 2.5-2.75. Rob, he looks at most 0.5 inch taller than a self-proclaimed ''5'7 and a bit'' man like Alex Click Here if not the same height. He also looks a full 3 inches taller than 5'11 Damon Albarn Click Here even though it's not the best shot. 5'8 was a safe bet I believe. Well ok 5'8.25" is alright. Sometimes in photos it can only look 1 or 1.5 between the brothers and we don't always know their footwear , but in general next to other people he honestly doesn't look under this listing. Yh it wouldn't make sense to keep him at 5ft8 flat just because he looks it with one person (Liam) when he can look over it with a plethora of other people. A strong 5ft8 is what he looks and it also happens to suit his two claims of 5ft8 and 5ft8.5. @Rory Liam has consistently looked 2 inches taller than him and he isn't over 5'10" flat judging by pictures. Although this listing is still decent in my opinion. 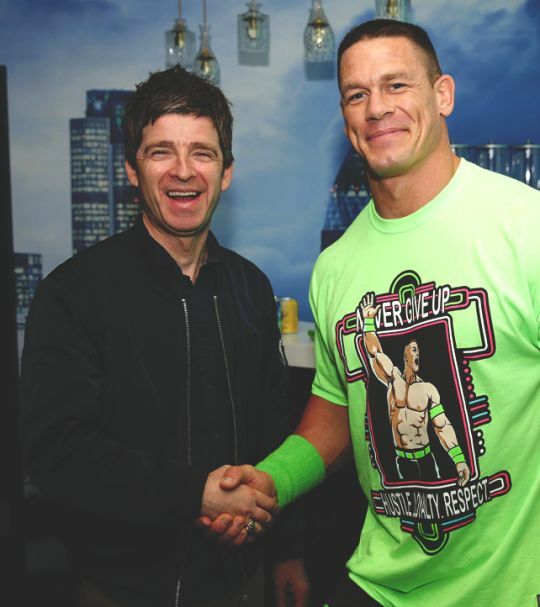 I think 5'8" flat for Noel is ok.
Editor Rob: I did have a look at him a few times again and thought the odds of a solid 5ft 8 were decent...with Cena, he looks taller than someone like Daniel Bryan Click Here. How is it an unnecessary upgrade ? Noel can look 5ft8.5 half of the time so a strong 5ft8 range is very fair. He has inches on guys like Hatton,Tevez,Aguero. Uncessesary upgrade, but he could measure anywhere 5'7.5" to 5'8.25" though. Yh 5'8.25 is a good call looks spot on. The counterpoint to Noel being 5' 8.5" is Liam's height. That would mean Liam's more like 5' 10.5" - as he's about 2 inches taller than Noel. But if you see him with people like Damon Albarn and David Beckham (both 5' 11") or Chris Rock (5' 10"), Liam looks 177 cm absolute tops. Also, look at Noel with Johnny Depp and Kate Moss - looks more like 5' 7-8" at best with them. Editor Rob: at times there seems anywhere from 1.5-2 inches between the brother's. I think a solid 5ft 8 range is ok for Noel and roughly 5ft 10 for Liam. Editor Rob: it's a possibility for him.. I think he edges out Simon Cowell in their picture. I really do think 5'8.25-8.5 is possible for Noel. @Charlie LOL @ him looking very tall, he mostly looks upper short/weak average because that what he is. Legit 5'8" (173 cm), maybe slightly under (171-172 cm or 5'7.5-5'7.75"). He does look very tall 5'8 seems about right for him. Hey Rob ! If Noel is about 5´8, where is Tom Meighan from Kasabian ? Looks 5' 8" with most people he meets. I think 5'8.25 for Gallagher, he never looks under 5'8 Imo. He is pretty close to 5'8", if not then a shade under like 172 cm. He says his height is 5'6" on Talksport. Do you think he's just joking rob? Editor Rob: yes if he said 5ft 6 I'm sure it is a downplay of some sorts. I stood next to Noel in London in the summer of 96. I was on a school trip and we were five students walking down the street and Noel passed us. We got his autograph. He was 5'8''. I would say close to 5ft8 (173cm), 5ft7.5 (171-172cm) or at least 3 inches shorter than 5ft10.5 (179cm) Damon Albarn. Noel confirms on Talksport dated 29 July 15 that he is 5'6"
Met him some years back. Seemed shorter than 5'8", and a very small frame too, which may have added to the illusion. Noel Gallagher is a minimum 5'8 in my opinion. I can believe his 5'8.5 claim. Here he is with 5'8 listed Segio Aguero, although I think that's Sergio's max height. omg Noel is absolutly not 177cm. Why would he downgrade himself by saying he's 5ft8.5 ? noel gallagher is 177cm, liam gallagher is 180cm it's same as paul weller and paul mccartney. damon albarn is 182 cm. carlos tevez is 173cm when he take a picture with noel, noel is taller. sergio aguero is 173cm and noel still taller than aguero. Noel Gallagher: "I'm only five-foot-eight, yeah". Yeah, I've seen that interview, Dean. Noel's awesome, lol. 5'8" is about right though, and he's usually an honest guy. He's 5' 8". Liam's 2 inches taller. I'd have actually guessed 5' 9" originally, he comes across as an average height guy to me. But that would make Liam 5' 11" - which he's not because Damon Albarn's 5' 11" and he's clearly taller than Liam. yes dean that interview! Do you know where on yt is it? I though he said 5ft6 there. Anyway, about 5ft8 at least. There was an interview that sticks in my mind. He said something then said 'but Im only 5ft 8'. The interviewer then said 'im 6ft 1'. He replies 'Well Im a multi millionaire'. hes claimed 5'8 and hes not the type of guy to underplay his height..if anything over play. Id say 172-173cm. He's 173 cm. Another listing Rob has spot on. Liam is almost 2 inches taller at 5' 9.75". Noel with 5'6'' Ricky Hatton Click Here i could belive his claim. Probably 5ft7, thought I remember him claiming 5ft6 on some show. Can look anything 5ft6-5ft8 and has claimed those heights before too. Nothing over 5ft8, nothing under 5ft6. Met him last night. I'm 5'7"and he had at least 2-3 inches on me. I would say 5'9" to 5'10" He stood next to my friend who is 6'and he was just a bit shorter but he may have had some help in the shoes. 5 ft 7. Defo downgrade. He's always been 5 ft 7. Yeah, looks a few inches smaller than Liam. More talented though. He's 5 ft 7. Defo downgrade. Very slight frame/build too. You have to downgrade his height to 5'7". the same height as statham so 5'8 is possible. pretty accurate.. 173 at most.. I want a photo with him. In fact, next time he is at BBC radio I will definitley! But they aren't Lozzer. So thats the end to that little anecdote. If Noel was 5 foot 6 he wouldn't look like the 5.8 that he is. Simple really. Saw Noel and Liam lastnight! They looked tiny to be fair! It was from a few metres away but liam seemed 5'8 and Noel 5'6! Alright. I geddit. Sort of. Noo bobo I was saying that I was comparing the photo of me and hatton with the photo of Noel and hatton. I am 5'8...NOEL looks taller next to hatton in his picture... This is because it was when hatton was boxing... And boxers usually don't wear shoes..... Hence why Noel looked taller with him. Whilst when I met him... He had a big heel on... Hence why I looked smaller in comparison!! I had a 0.75in heel on! I have never met NG. Ever. I have seen him loads of times at intimate acoustic venues. And he always wore flat shoes. I actually don't understand the first two sentences of your last post, Lozzer. Who was in the smart heel? who made you look smaller? Why are you telling us? If Hatton was in Bare feet, why are you smaller in comparison? WTF? Bobo... Hatton was in smart clothes when I saw him with a pretty hefty smart shoe heel... With Noel, as he is usually boxing he is probably in bare feet, therefore making me look smaller in comparison! Where can I meet him aswell lol? Noel gallagher does not wear lifts. He is not bothered about his height. He is perfectly at ease with himself. Everytime I have seen him he was worn flat trainers. He also has rather academic coudln't give a monkeys slouch going on. He suits his height and is well proportioned. I would say 5.8 or taller if he stood up straight. To debate less is just trolling. Oh and by the way... Hatton could well be 5'6 but after standing next to him in his gym in Hyde for a good 10 mind I'd say 5'5.5" for definite... Trust me! JP... evidence but no proof my friend! I met hatton a fortnight ago and got a similar pic of what Noel had with him. I am bang right on 5'8" in the evening and after comparing mine and niels pics with him... hate to say it but it seems Noel has the height advantage in the pics! Noel passed me on Marylebone High Street a week or so ago. I was surprised how short he was. 5' 6" or 5' 7". I'm 6'. He is 5.8 or taller its stupid to debate any less. There are far too many pics with him and Ricky Hatton as well as with Russell Brand. I would even say 5.9 after standing about 5 feet from him in Moscow Russia. He has quite bad posture but is very much in proportion, quite Pixie like. But he doesn't come across as 'small' just, well, average. He suits his height. Anything below 5.8 is just trolling. Noel is 5' 6". See this video Click Here from 6:27. He says himself as "****ing five-foot-six". He say's that in order to make the reporter seem like he has a massive advantage over him and for comedic effect because he's quite clearly not insecure about his height, he's stated 5'8" plenty of times, the man is 5'8" at least why can't you people handle the truth the photo's i posted quite blatantly and clearly prove that and every other celebrity i've seen him stood next to suggest he's a least 5'8", just accept it for f***k's sake! Ricky Hatton is one small guy. I'd like to see him against Hector Camacho 1985. 5' 8" is ridiculous. I stood right next to him and he was a very weak 5' 7". According to his book he is Ricky Hatton is 5'6". Found these and remember Ricky Hatton is 5'6+. Doug and anyone else who disagrees, he's 5'8 at the very least end of story!!!! First photo, stands next to 6'2" Russell Brand who would absolutely dwarf him if Noel was anything below 5'8. Second photo, stands next to 5'11 Paul Weller and Paul McCartney looks a couple of inches shorter if that. Third photo, he's next to 5'6+ Ricky Hatton and Noel has his head tilted taking an inch of his height, he would be 2-3 inches taller altogether than Hatton if he stood up straight. Can't believe it's taken this much proof for people to believe Noel Gallagher is not 5'6 and 5'7 at the most like some people keep saying, I really don't get it! He's 5'8 at least, clearly!!!! People have odd judgement. walked past him on oxford street in the mid-90s. he did seem to be about 5'8" but i didn't get a good look at his footwear! 5'8"? Na he is 5'7" max. Why would he frequently be called a "dwarf" if he was 5'8"? Robbie Williams isn't exactly 6'6" himself is he? It's funny ain't it, you'd think they were massive chaps the way they walk around with their chests out etc. right! in this photo he's stood next to 6'0 tony blair, you can't tell me he's less than 5'8... face it thats his height end of story! I stood next to him waiting to cross a road in central London a few years back. He was quite a bit shorter than I imagined he would be. 5' 7" max, possibly 5' 6"
5'8"? Mmm always looks 5'7" to me. He often looks a little under average I think, especially when interviewed by female presenters who have to stoop down to interview him. My sister stood next to them the day before yesterday at Bruxelles airport (they're on tour), and she was astonished at how short Noel is..she said he looks 5'7''TOPS, maybe shorter. Also, she said Liam looks about 5'11''(180 cm). I stood next to Noel, Liam and Bonehead on a sidewalk in Manhattan in the mid 90's. I'm female; 5'7" ... Noel was about an inch shorter than me, and Liam seemed atleast 2 inches taller than me. Stated that he is 5'6" in an recent tv interview. no ways not 5 8... i have a pic of me and him... i'm 5.3 he must be atleast 5.6 no more than that. from gawker.com: "Noel Gallagher from Oasis (sooo short! and angry!) crossing the street at 59th & Madison". You can find out yourself how tall noel is if you know where the bbc r2 house is. It's easy to get to! Noel goes there like every week or something - get yourself an autograph! Contact me via messaging if you want to know! This definitely needs a downgrade. He's 5'6" - I remember him saying it himself in an interview in the NME when Oasis first came out, and Liam is not much taller at 5'8" max. I remember when I was young (THOSE WERE THE DAYS) and I read in the 'Smash Hits' about Oasis and it was an introductory piece about the band. It said and I quote, Liam, not very tall - 5'8" and Noel, a bit titchy - 5'7". It must have been a 1994 issue, selling the big issue! Have met Noel and seen him at football quite a bit if he stood up straight he could make 5ft 8.5, doesnt have the best posture. Wouldn't call him a dwarf. in Manchester 5ft 8 is about average we are all under nourished! Hey Natalie you talking about Noel or Liam? Noel can't be 179 cm, but Liam, yes. Rob why don't you add Ian Brown to this site, you've got all damn soap stars listed here but comparably few musicians. As for the comments below, Ian Brown is not 5'9", he is exactly my height which is 5'8.25", I've seen him enough to be able to tell. He is very skinny and has a big head, which makes him look even shorter. And Noel Gallagher is smaller than Ian, I believe he's around 5'7", but I'm not sure about him. I've met Noel twice; he is a LOT smaller than me and I am 178cm [5'10]. He is around 5'6 and has tiny feet. Excuse me Scott and johnnye but you're wrong! Noel is 5'8.5" and Liam is 5'10", not 5'7" or 5'8"...I think that you don't know them! I saw q awards in October 2005 and there is not a very big difference between chris and noel, but I think noel wears big shoes. What is the average height for a man in the UK? I cannot believe it! The so-called hardman of pop (Liam) and his brother are pygmies? I stood next to him at a party and I was amazed at how small he was - especially for someone who's always going round trying to pick fights with people... I;m 5'8" and I would say he was about 5'6"
noel definately aint more than 5'7. You can quote Noel saying "5'8" but everyone knows short celebrities often add a couple inches onto themselves. Met the man myself as saw Liam and Gem go by and got Noels autograph back in 2003 during the HC tour, I'm 5'8 and Liams taller than me but Noel I stood right next to and he was at least an inch shorter. Hes listed as 5'7 on most Oasis fan sites. My friend whose about 5'8 got his autograph a few years back and said he didnt know Noel was so tiny, claimed he had at least an inch and a half on Noel. I often see him around Marylebone, London. I'm exactly 5'8 and wear ballet flats - he is WAY shorter than me, 5'6 at the most. I've met him, there is no way he is 5'8" he is considerably shorter. How can you be sure that he is 5ft 8in? Cause, I think he's MUCH shorter. Did you measure him yourself? hhmm... I think he's lieing in his quote about god being 5'6 and him being 5'8", cause he's small, im tellin ya. Noel is 1.75 or 1.76 cms... i was with him in the Chilenian part of the "Be Here Now" tour in 1998... and he was exactly as me... 1,76... both where with snickers... Saludos desde Chile. www.oasisfanatic.com says that he´s 5ft7. anyway, he looks very big on tv. Saw a video clip of him singing "Live forever" together with 6ft1 Chris Martin, I`d say 5ft7. "God is 5'6", I'm 5'8" - Noel after his comments about Oasis being bigger than God.